Pretty Things: The Lark Book Giveaway starts! Thanks Lori, you are always so generous! That chain one is for me! Nice Books! I am real interested in them. You are so good to offer them to your readers! I just posted on facebook! so lucky to get to review these wonderful books! have fun! Oh wow - that would be great! I adore the process of gathering chain and combining them with beads. That is one of my favourite ways to create a necklace. So, I would enjoy delving into that book on chain and how to create it myself. Thank you for offering this giveaway and for reviewing these books. The one on beading with seed beads looks GREAT, too. I have only experimented with that family of techniques but would love to learn more. I would live to win one, though I believe I have the 30 min bracelet.. :) I will fb about it!! How will you be able to part with these gems? I am mostly a seed beader and I have been looking at that book. Thanks for doing a giveaway. Am LOVING that Chain book! Thank you so much for everything Lori! Love your blog! Wonderful giveaway - and looking forward to see more of the books! I would love to win the Metal Clay book! Thanks! Sharing on FB right away. I'd love to win Sabine's book! I'll fb this next! Thanks, Lori. Am just getting into Metal Clay...would love to get inspired by this new book! Haha every is about the chains.. I am too. I LOVE reading about PLC bit don't have any right now..
Oooh--I'd love to win one of these books. The metal one looks awesome! Chain, chain chain - - - now that's the ticket. Thanks for the opportunity Lori. I love Lark Books. Oooh, I'd love to win one of these books. The metal one looks awesome! Forgot to add I'll be blogging about this tomorrow....I'd love to pass this on. I've had my eye on Beaded Fantasies since Lark offered a free pattern from her collection. Gorgeous projects, and from what I've seen she makes it super easy to follow and adapt to your own style. Love Sabine's book. It is fantastic! Thank you for being so generous! Sharing on my facebook page! Wonderful books. Thanks for the giveaway. Posted also on my FB! Amazing! I would love the chance to win any of these books. Thank you Lori for your generosity! Please pick me. These would be great for a newbie like me. I am so glad we have joined as friends you have so much to offer. I love Sabinne Lippert art, as a bead embrodierer i found a lot of inspiration from her wonderfull blog, i hope i can win it!! That chain book looks wonderful and I promise that I would love it and pet it and take it home to mommy. I also shared this giveaway on my Facebook page. Thanks Lori, what a great giveaway! You rock. Posting this on FB. Thanks Lori, what a great giveaway. I'm posting this on FB. I really love the look of the metal clay fusion book. Will be posting on Facebook anon! I would LOVE the book by Gordon K Uyehara as I have been following his work for sometime now. But the other two also look great for learning. I would love to win Sabine's book! I've heard that her projects are very well designed - not just for visual appeal, but also for ease of beading. I have my eye on the book "Beaded Fantasies". It looks like a must have. I just love beading. thanks for this great give-a-way. Shared on Facebook. Thanks for the reviews, always fun to read and helpful. I'm a Canadian, but would share in shipping cost if I won one of these lovely books! This book might just be the inspiration I need to get started wit hPMC!! Metal Clay fusion might be just the inspiration I need to get started with PMC! Thanks for your generosity! I would love,love,love to have that metal clay book! I am learning all I can about all the posibilities involved in using metal clay and entranced with this wonderful medium. Posting your reviews on my facebook page and my metal clay yahoo group! I bought Sabine's book. It is inspiring. I think my next piece will be from her book- I want something with no surprises! Artful Projects (Metal Clay Master Class)" by Gordon K. Uyehara. This artist creating the miracles, so it would be A BIG suiprice if I win this book! Thank you for the chance Dear Lori! Metal Clay Fusion- might just be the inspiration I need to get me started in PMC. I hope I am lucky enough to win it in this generous extravaganza! beaded Fantasies sounds like it was meant dor me! i would love to win this book! I am a bead/craft bookaholic and I'd love to have any of these books in my collection. Sorry if this posts twice. I also have a Canadian address, and would love to share shipping costs. My mom took a PMC class and fell in love! I'd love to win that book and send it to her - she has been such an inspiration to me in creating my own pretty things. I'd love to win that Beaded Fantasies book. How cool to get to do book reviews and give them away too! I would love that Chain, Chain, Chain! Oh, wow!! I'm blown away just dreamin' of aall the cool projects I can do OR improve with any of these books in MY library!! Thanks for offering the chANCE TO WIN ONE. Wow, I'm blown away just dreamin' of all the cool projects I can do or improve on with any of these books in my personal craft library! Thanks, Lori for giving us a chance to win any of these books. That is so very generous of you... Bless you. That seed bead book has been on my Amazon wish list for a while. Thanks for your generous offer, Lori. Whoever wins any one of these books will be blown away. Lori, I would be "over the moon" if I won any of these books. Thanks for giving us the opportunity to do so!!! Thanks again for sharing the abundance Lori! The chain book looks way cool! Wow each of the books are impressive! Oooohhh!!! All the books look wonderful. I'd love the seed bead book though. I wrote about your giveaway on facebook. You're so generous sweetie!! please include me, I don't have any of these on my shelf and could use some new inspiration/ideas! How fun. I would love to have the beading book:) I will also blog about this tomorrow. Thanks! I don't have any of these books, surprisingly, so I would love to win any of them!! Thanks for the giveaway!! Beaded fantasies!! Wow! I would love to win this book! I love to use seed beads and would love to expand my abilities!! Oh and the bead embroidery is an awesome book too! I love to do bead embroidery! Oh, my...I've been lusting for Beaded Fantasies...thanks for the chance to win it! The Metal Clay Fusion Book seems like the one for me...but they are all fabulous I'm sure! I really like the CHAINS book! It looks very interesting. terrific giveaway! I already have Gordon's book- and it is fantastic! I'd be willing to share in the shipping cost and would love to see the 'Beaded Fantasies" in real-time! Fantastic book! Masterpieces! Sabine is my favorite book! I live in europe, hungary! Gordon Uyehara's book Metal Clay Fusion is in my personal library and I would fully recommend it to anyone wanting to play with Metal clay's. That chain book looks delicious and I would love to add that one to my library. I am familiar with Joanna Goldberg's work and have seen other books she has written. Great artist, this book is sure to be a winner. Thanks so much for doing these reviews. The book on 30 minute bracelets is intriguing but with trying to live frugally I need to be really sure before I make a purchase. Are they original? Are they too basic? Do you need a lot of specialty tools and materials? Do the instructions include every step? Etc. I look forward to reading your comments especially on this book. Not a seed beader, but I would be SO interested in the metal clay book!!!! Would LOVE that one. Sounds really cool that you got to read so many books! Thanks for this awesome giveaway!!! Love the chain book. I would love to have the 30 minute bracelet book. I would like to win one of these books!! I can see curling up with these books on a nice cold winter's day here in the northeast and day dreaming about all the beautiful possibilities. Like having little museums at your fingertips! What a wonderful job you have, reviewing books and then sending them on to others! I own the one by Sabine and just love her seed bead designs. I'd love to own the book on chains so please put my name in the hat! Thank you for having such a great book give away. I hope I can win either 30-MINUTE bracelets or BEADING with CRYSTALS. They all look like great books! I've joined your site here and will FB and post there too! Beaded Fantasies is the one for me. oh my....it would be so hard to choose which one i would love to receive as i love them all !!!! I absolutely love sabine lipperts work. Can't get enough of it. She definitely had a40 eye for beading. The chain book looks very interesting also. Thanks for sharing and giving all of is a chance to win! What a great variety of books to choose from. I think I would like the book Beading with Gems. Looks like some great projects in this book and a good resource to work from. Thank you. Wow! Beaded Fantasies is just what I need right now! Thanks for sharing with your readers! Love to win any of these...Lark books are always some of my favorites because they are both informative and visually pleasing! Any one of these books would be a welcomed addition to my collection! Thanks. 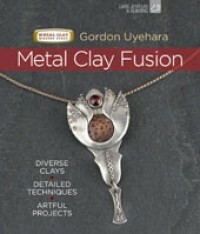 I am very interested in Metal Clay Fusion by Gordon Kuyehara.....my next adventure. I feel an addition comin'on! :-) Love this site! I feel two addictions comin' on! So now you have more Work to DO!!!! I would have a very hard time parting with any of these books!! You are so very generous Lori!! Oh I would love to win either the chain book or the beading book....I love both chain and bead weaving!! Thanks for giving these books away. I will blog and FB this giveaway! What a fabulous giveaway. There is something in each one that I've been wanting to learn. I've been trying to play with PMC, but the cost is so great for silver clay and I'm always afraid that I will make a huge mess...I've also been making links from copper and steel wire - on my way to making chains. Of course being a seed beader, Sabine's book is on my list of to-reads. Thanks for such a great selection - really something for everyone or in the case of many of us, something for every mood. I've posted the giveaway at fb. I would love to add any of these books to my collection. What a great offer! Thank you! Chain me, I am all about chain so this would be perfect for me. Thanks for the awesome giveaway Lori. I will fb as well. Chain me, I am all about chain so this would be a perfect book for me. Thank you for the great giveaway Lori! Great giveaway! I'm in Canada but would happily share shipping costs if I win. Thank you for the book giveaway offer! The Beaded Fantasies looks like a fun book. I know I can learn from it! Metal Clay Fusion or Chains book, please??? I'm a metal worker! Thanks for the opportunity to enter. Thank you Lori for your generosity. I would like to win any of the books, so I may share it with a crafty friend in South America. All the books look GREAT!! I would not care which book I would get if I was chosen!! he he Thank you for the giveaway!! Would love to win any book, what an awsome idea. I am in Canada so would share the shipping cost. Wow your so unbelieveable with everything you do and keep up with, you are a very remarkable person with alot of strenght through your bad times and good you just keep on keeping on, I like that alot, and wow now a give away to would love that but knowing you is really a good thing to. These look awesome! Thanks for the giveaway. What a great oppurtunity to learn something new! Wonderful books. I would be pleased to have any of them. Great giveaway. I'll FB post this and then blog about it later. My birthday is the 11th so it would be a great birthday gift to win a book!!! They all look interesting, but I may have to get the 30 minute bracelet book, unless I win it. I would have sworn I added a comment but I couldn't see it. I love the idea of the Chains book. But I see there are a couple others on my lust list down the line. LOL You are a great person to give them away after your done!! Wow, another fantastic opportunity because of the things that you do. All three books look really interesting. Any of them would be a blessing. I think the chain book would be most helpful to me right now. Wow what a great giveaway! As a seed bead lover, I would love to win the Beaded Fanasties book. You do such an awesome job at every giveaway and bead hop you sponsor. Thank you Lori! I really like thier books-great detail. I look forward to your reviews. I love books, especially any kind of crafting books. I have made a few pieces of beaded jewelry. Would love to see the Metal Clay book sounds beautiful. Cool idea! I love love love Sabines book and I am very interested in Beading with Crystals book. I shall post on Facebook and in my group chat of beaders and that will get a few of them here to see ya! Love love Sabine's book! I am interested in the Beading with Crystals book! Posted on Facebook and told my beading group (500 peeps) to get over here! Thanks! I've been wanting to learn more about metal clay. What a great give away, Lori. Thanks for the chance to win one of these books. Awesome giveaway--would so love to win! I have a bad addiction to jewelry making books. I just love to see how stuff is made. There are definitely a few in this group that I'd like to add to my collection. Hi! 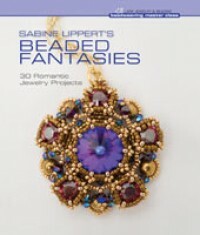 I would love the Sabine Lippert's Beaded Fantasies book... my daughter could make some really nice new things for me! S&H if I were to win 'Dimensional Bead Embroidery'. I have always wanted to learn how to do this. Fantastic collection of inspirational ideas. My goodness, this is like heaven. I would love to have the metal fusion book, the fantasy beading book just calls to me, and those chains, well, I could just get all wrapped up. These are all great books. Would love the chain book to advance my skills. Thank you Lori and Lark!! This is such a cool thing for you to do! I would love receiving any of these books - none would go to waste! I'll also post your offer on my Facebook page and on the South Jersey Bead Society blog. Fantastic giveaway! Thanks for sharing and great books. All the books look marvelous. I love jewelry! What a great give-a-way! I love Sabbine Lippert and would ♥ to win! Thanks for the opportunity! Wow, great books, love the chain book, thanks for the review. Just Facebooked (because that's a legitimate verb now, right?) about it. Very exciting! Awesome giveaway! Thanks so much for doing this! Posted on my Facebook. Such awesome opportunities you offer us... thanks for your generosity and genuine interest in our development. These books all look great - any would be a terrific addition to any library. I will blog and share on facebook. It's like Christmas. All of those look wonderful. Thank you for the reviews! I always prefer reading reviews from people I know/trust! 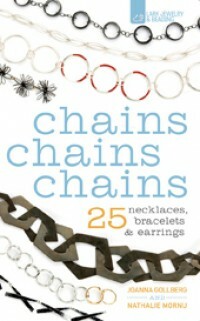 I have been wanting to find out more about Chains Chains Chains: 25 Necklaces, Bracelets, & Earrings. Sounds and looks like a fantastic book! I have the Sabine Lippert book which is wonderful en very inspiring! I'm almost as addicted to bead books as I am beads. These look fantastic - I would love to win one of them. I love Lark books!! I have several and I use them all the time!! Please enter me in the drawing for this wonderful book! Thanks for this generous offer. 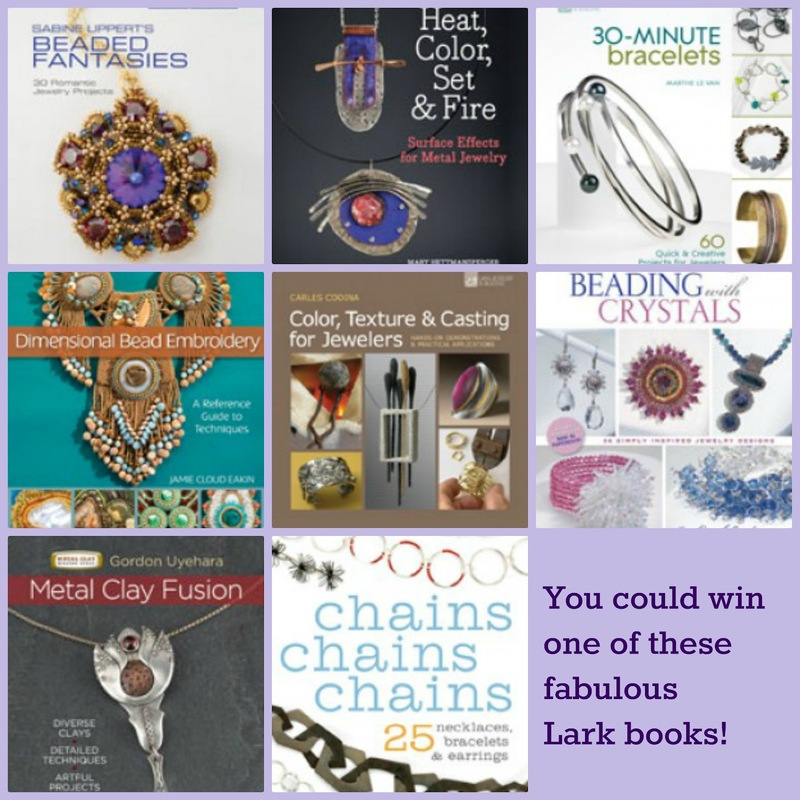 would love love love to win color texture and casting for jewelers...or any of these wonderful lark books. The 30 minutes bracelets and the Chains, Chains, Chains look like fun!! So nice of you Lori. I love them all but I think the metal clay and the seed bead book interest me most. I love books on jewelry making in any way shape or form. Would love to win one of these books! Thank you! The Chains, chains chains book look great! I love working with chain, so that's definitely something I'd be interested in. Wow - I would love any of these books if I were to be drawn!! Thanks you! Both books sound wonderful. I need to pull out my seed beads and make something new---new ideas might get me up and beading.